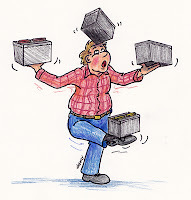 The RV Doctor: How Are the RV Batteries Connected? How Are the RV Batteries Connected? Will, since all DC electrical components in your motorhome are powered by 12-volt battery power, two 6-volt batteries must be connected in series in order to provide a final, 12-volt output. Here’s another post that may be of help to you. Check this out. Also, FMC Magazine published one of my in-depth articles, "The Balance of Power," you might find helpful. Feel free to contact FMCA and request a copy of the January 2012 issue.